The National Cadet Corps plays a significant part in molding a person's character. It fosters the spirit of teamwork and man-management and leads to the development of a more pleasing overall personality. To channelize the energy and dynamism of young men towards activities beneficial to them and to the society. Constructive use of leisure time, wholesome recreation, wide cultural sympathies, abiding social consciousness and an alert mind. Recognizing the importance of the NCC, the Institute offers the students an opportunity to be part of the NCC. The Institute has strength of 100 cadets. 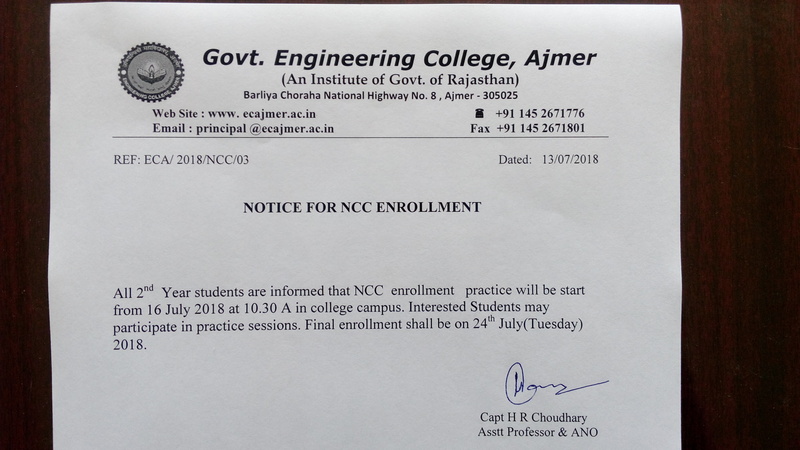 All the incoming students who had opted for NCC are required to enroll themselves in the first year for 2-Year course. The Institute cadets are part of the 2-Rajasthan Engineer Coy. NCC Ajmer. Various social activities are also organized to encourage the feeling of belonging to the society. An Annual Training Camp is held to further enhance and inculcate a feeling of independence in the cadets. Extensive knowledge about devices used in the Army like mines, bridges, nuclear and biological weapons etc. is imparted. Self defense training is also given. Rigorous physical training is provided in the camp with a view to increasing the physical endurance of the cadets. Military training with rifles is also provided. Cultural programmers are also held with a view to improving the cultural and social outlook of the cadets.